Asking questions is one of the most effective ways to gather data from the field – so what if I told you that ArcGIS can now support a more intelligent survey workflow? Survey 123 supports complex and branched logic, and allows you to embed media, and other capability into your survey – like a signature panel! This ability to be adaptive in the field can support a more sophisticated information gathering – often the answer to one survey question will determine what the relevant follow-up questions are going to be. 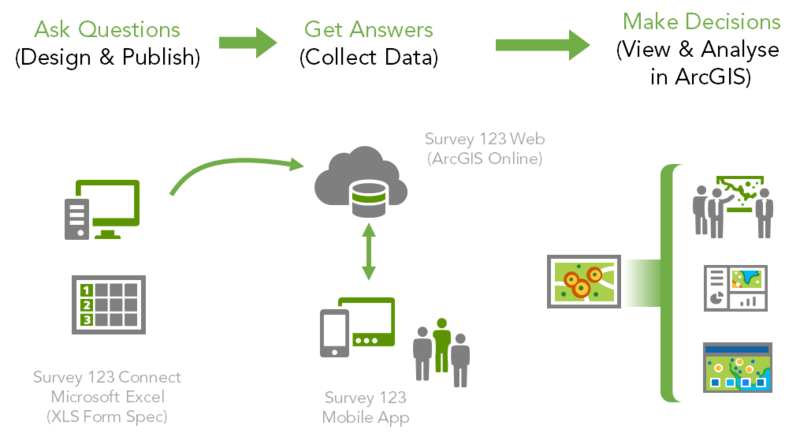 Survey 123 for ArcGIS provides an end to end workflow for authoring and implementing surveys, with geo-located responses. The following diagram represents the workflow and the key components demonstrate to help you achieve this. Conceptual workflow for Survey 123. To get started, visit the Survey 123 web site – this becomes your one stop shop. Use Survey 123 Connect (a downloadable desktop app for Windows, Linux and Mac) to help you author your survey. It enables you to design your survey in a spreadsheet (using the XLS Form Specification). Once you are happy with your survey – save it and it automatically renders in Survey 123 Connect. 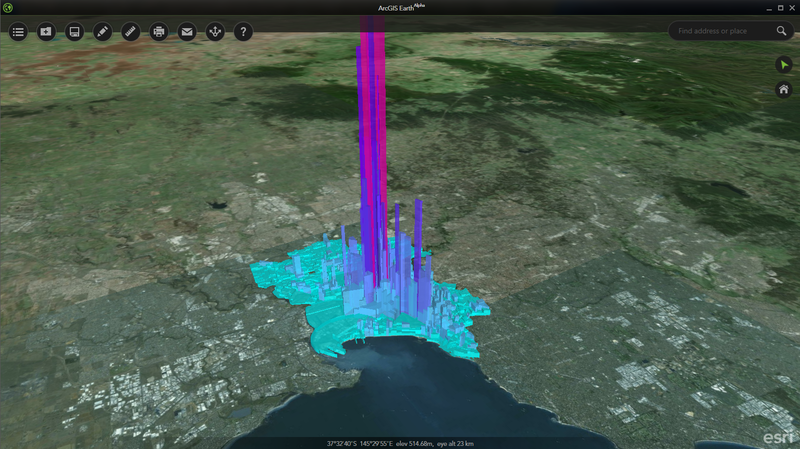 Sign into your ArcGIS Online Account – and publish! To collect your data, download the Survey 123 App to your device from the relevant store. I created a simple survey in our sessions, and we used to app to collect some data from the audience. 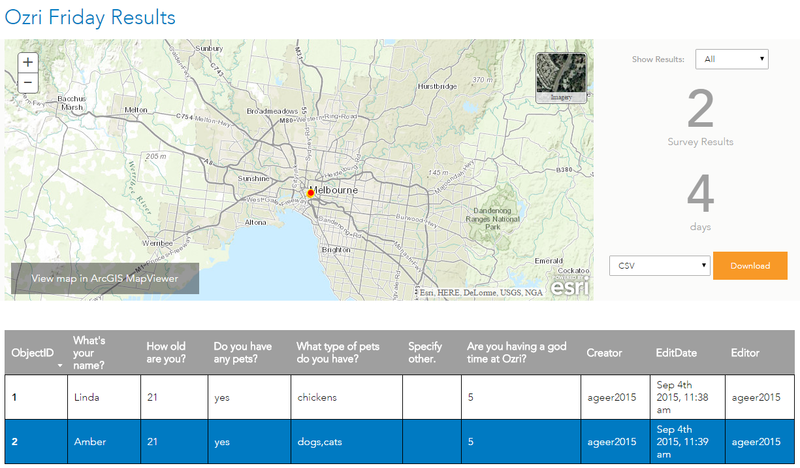 Once collected, we can view this information in the Survey 123 results viewer – which has a neat map interface for us to visualise our survey data. The Map as seen on an iPhone. Our Survey, as seen using the Survey 123 App! The Survey 123 Results Viewer – Friday’s Survey Results. When we break it down – Survey 123 provides a really intuitive way to design a feature service and web map that lives in our portal – we access it via the mobile app or through the Survey 123 website. So, knowing what we know about the ArcGIS Platform, we can then leverage this service/web map in downstream apps, like web apps and dashboards. Right now, we can’t share our surveys with the public – just shared with groups within your organisation…however I understand this capability will be coming soon. The second part of the session took a brief look at ArcGIS Earth – which will be released in Beta in October – first release is planned for early next year. ArcGIS Earth will be a free, lightweight, desktop globe app that allows users to explore 2D and 3D content from their portals, as well as supporting KML-based workflows. ArcGIS Earth is based on the .NET Runtime (10.2.6), and will provide a mechanism to view rich ArcGIS Online content – for example Basemaps and other content layers – in conjunction with your own geographic resources, including your web services, local files and KML. If your content is secured or you want to access ArcGIS premium services – you will need to have an ArcGIS Identity. 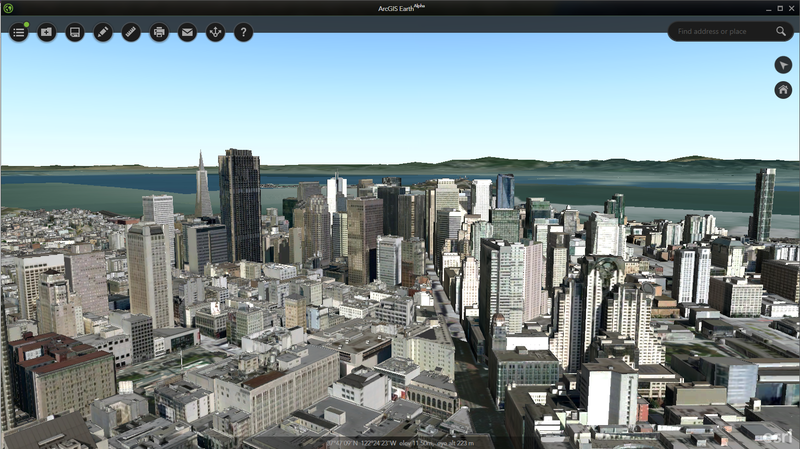 Pictometry data for San Francisco – streaming via a Scene Service in ArcGIS Earth. KML representing the daytime population of inner Melbourne. To wrap up, here are the important resources to keep an eye on. For Survey 123, everything you need to know is on the website. From here, find the link to the blog and new group on GeoNet. For ArcGIS Earth – Beta relaease is planned for October, and the first release is planned for early next year. Keep up to date with all the news for Earth here. 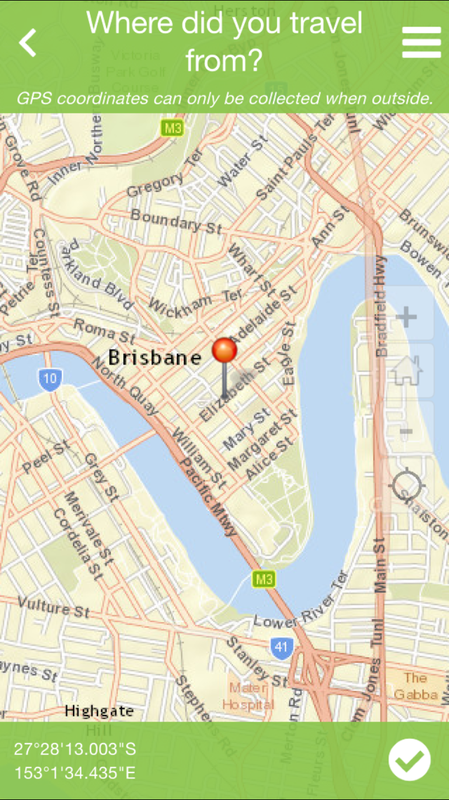 In the meantime if you have any questions – please feel free to post them here, or contact your local Esri Australia office. 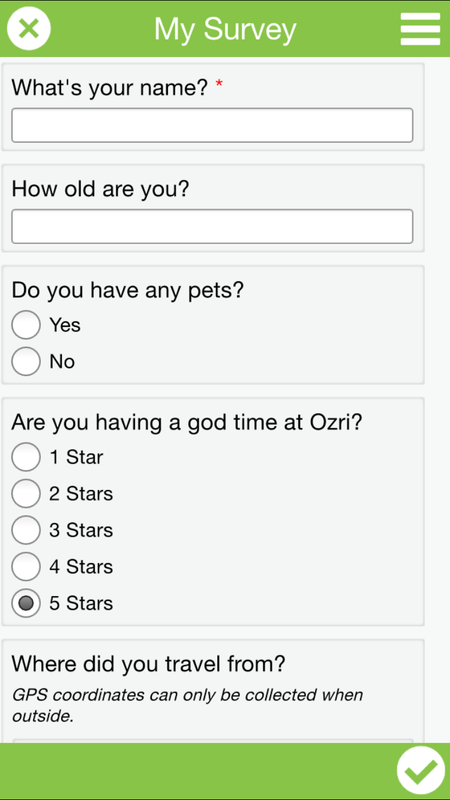 I hope you enjoyed Ozri – and look forward to hearing everyone’s suggestions for Ozri 2.0!